Ramsey, Robert, head-of-household, age 37, born Dec 1862 in Pennsylvania; parents born in Pennsylvania; married 3 years; occupation: farmer; owned farm (free). 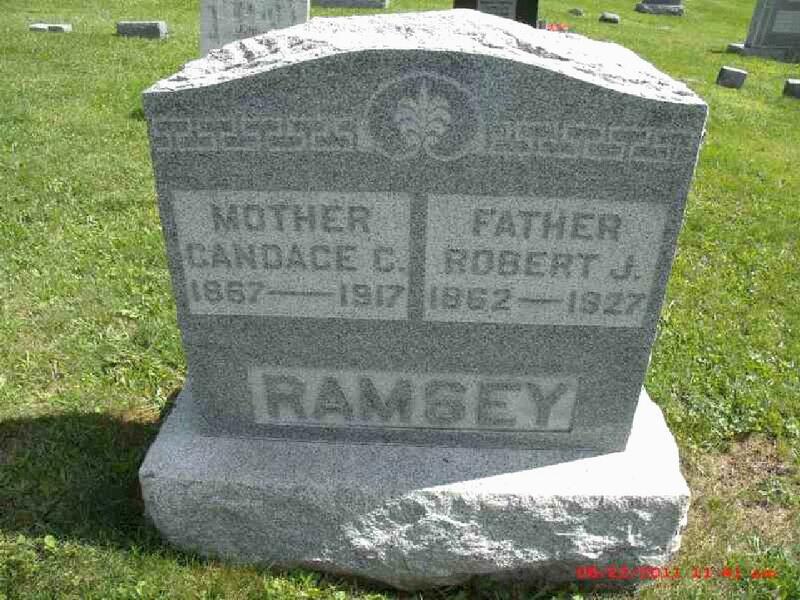 Ramsey, Candace, wife, age 32, born Sep 1867 in Pennsylvania; parents born in Pennsylvania; married 3 years; 1 child, none living. Ramsey, Robert J., head-of-household, age 47, born in Pennsylvania; parents born in Pennsylvania; first marriage, married 13 years; occupation: carpenter, house; owned home (mortgaged). Ramsey, Candace, wife, age 43, born in Pennsylvania; parents born in Pennsylvania; first marriage, married 13 years; 4 children, 3 living. Ramsey, William, son, age 7, born in Pennsylvania; parents born in Pennsylvania. Ramsey, Mary E., daughter, age 5, born in Pennsylvania; parents born in Pennsylvania. Ramsey, Charles A., son, age 3, born in Pennsylvania; parents born in Pennsylvania. Ramsey, Robert J, head-of-household, age 57, born in Pennsylvania; parents born in Pennsylvania; widower; owned home (free); occupation: carpenter, rubber shop. Ramsey, William, son, age 17, born in Pennsylvania; parents born in Pennsylvania; occupation: bookkeeper, rubber shop. Ramsey, Mary, daughter, age 15, born in Pennsylvania; parents born in Pennsylvania; attended school. Ramsey, Charles, son, age 13, born in Pennsylvania; parents born in Pennsylvania; attended school. 1870 census, Reedsville P.O., Brown Township, Mifflin County, Pennsylvania; roll M593-1375, page 271, line #24, dwelling #95, family #99. 1900 census, Armagh Township, Mifflin County, Pennsylvania; roll T623-1441, ED 128, page 4B, line #65, dwelling #69, family #76. 1910 census, Armagh Township, Mifflin County, Pennsylvania; roll T624-1376, ED 107, page 1B, line #73, dwelling #18, family #18. 1920 census, 4th Ward, Barberton, Summit County, Ohio; roll T625-1442, ED 270, page 2A, line #10, dwelling #25, family #27. Summit County, Ohio, Marriage Records, 1840-1980; http://www.ancestry.com. Ohio, Deaths, 1908-1932, 1938-2007; http://www.ancestry.com. Pennsylvania, Birth Records, 1906-1908; http://www.ancestry.com.